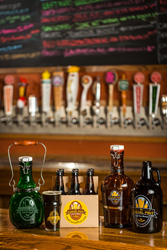 Touted for its laid-back environment, Casual Pint makes it easy to enjoy a brew or take one home. For us, The Casual Pint was a no-brainer. Its unique approach to the ever-growing craft beer movement sets the brand apart. The Casual Pint, a craft beer market and household name among beer enthusiasts in East Tennessee, will expand its footprint with the grand opening of a Loveland, Ohio location. Slated to open in November of 2015, the beer market will be located at 110 South Second Street, Suite B in Loveland, and will mark the 10th Casual Pint to open in the United States. Local entrepreneur Clint Elliott began the process of opening the newest Casual Pint franchise in December 2014. No strangers to the business environment in Loveland, Elliott has spent the last 20 years in the quick service food sector, successfully managing multiple franchise locations. In keeping with the company’s mission to share the craft beer experience in neighborhoods one pint, one growler and one person at a time, Elliot says The Casual Pint at Loveland Station will also work diligently to highlight and feature local Ohio breweries on their taps and in the market. The Loveland beer market, will feature 30 craft beers on tap and a variety of bottled beer for purchase and off-site enjoyment. With an ever-changing and always unique offering of craft beers, both on tap and for purchase in the market, The Casual Pint provides beer connoisseurs a one-of-a-kind experience. “Whether you want to try a pint of something new, or you’re looking for that six pack of the craft beer that always seems to quench your thirst, our goal is to provide our customers exactly what they want–the most extensive selection of craft beer available under one roof,” said Nathan Robinette, president of The Casual Pint. The opening of the Loveland location further solidifies The Casual Pint as the fastest-growing franchise in the craft beer industry, with more locations expected to open in the coming year. As the craft beer movement continues to grow, The Casual Pint is poised to bridge the gap between consumers and the rare, hard-to-find beers they crave. For more information about franchise opportunities with The Casual Pint, visit http://www.casualpintfranchise.com/.